With the musical crossover still fresh in my head, it's hard not to think about what songs would fit certain scenes in the latest Supergirl. "Distant Sun" featured a number of schmoopy moments that could have been punctuated by any number of pop love songs. Heck, a power ballad wouldn't have been out of place when Mon-El thought he was leaving Supergirl behind forever. But with Music Meister gone, no one burst into song (wouldn't it have been a fun, temporary side effect?) as Mon-El faced his parents and the DEO was put into a tricky position. Meeting the parents of your significant other is always a thing. It's not a guaranteed-to-be-awkward event, but it is a kind of relationship milestone. 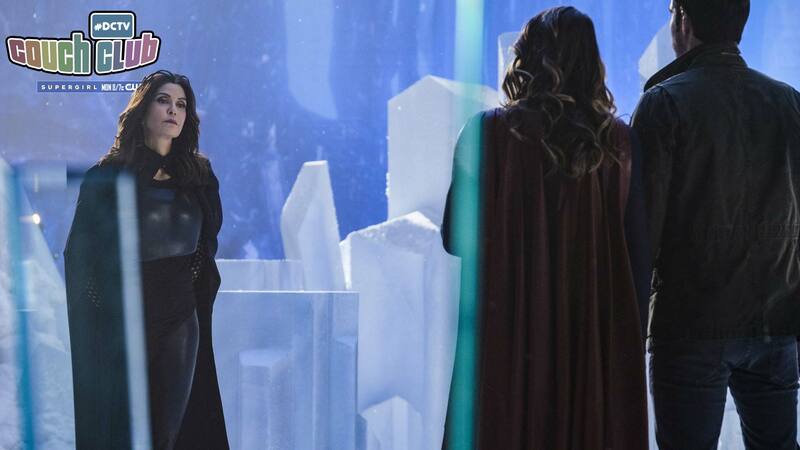 When Kara met Mon-El's parents, the King and Queen of Daxam, last week, it did not go well. The introduction and dinner was the opposite of smooth, and while Mon-El told his parents he'd found a new home and family, they didn't accept his decision. Well, Queen Rhea didn't. I've heard of some wacky antics parents have taken to keep their kids away from what they believe to be poor matches, but Rhea took it to extremes. She put a bounty on Kara's head—a bounty large enough to buy a planet. Putting the woman your son loves in danger seems like the worst possible way to get him to come home and be the ruler you want him to be, but what do I know? Side note: It wasn't only about Mon-El returning to Daxam with them. They wanted Mon-El to be exactly like he used to be. He proposed starting the Daxamite governing system anew and making the planet a democracy. His parents basically laughed in his face. That was before Rhea threw him into a dungeon. It had to hurt Mon-El to realize the king and queen, above all else, wanted to control him like a puppet rather than listen to their son and consider his opinions. The rigidity from Rhea floored me. At least Mon-El's dad showed some heart. P.S. to the side note: Queen Rhea needs to show the Fortress of Solitude some respect. I sympathized with Mon-El in this episode. Yep, I said that. Though I'm still mourning the crashing of my SuperFlash ship, I can appreciate how Mon-El got trapped between the girl he loves and his parents. He was put in an impossible position, and I don't want to know how he would have handled it without the positive influence of Kara and the DEO. He looked out for National City and for Kara first—he acted in a selfless way instead of a selfish one. What would Mon-El's arc have been like if Kara didn't return his feelings? I entertain that “what if?” scenario now and then, because comparing who he was with who he is shows she's affected him. Even if they weren't in a relationship, I think Mon-El still would have understood Kara is a model for good behavior. He's made progress, and "Distant Sun" showed us how much he's grown up in recent months. However, dude really does need to finish reading Romeo and Juliet. Elsewhere in the episode, the presence of the Daxamite ship hovering around Earth put J'onn and the DEO in a tricky spot. The U.S. President prohibited anyone from engaging with the ship in order to preserve peace, but once the Daxamites kidnapped Mon-El (he stayed of his own accord but they forced his hand), Kara felt she didn't have a choice but to rescue him. J'onn decided to help. What is it with everyone breaking protocol? Remember how J'onn had to scold Alex for coloring outside the lines earlier this season? I don't want the president to put the hammer down, but she'd be within her rights to do so. Of course, the president isn't exactly herself since she's an alien. Now, let's move on to a #DCTV Secret. We didn't devote time to this in the last episode because of the musical crossover, so we have some catching up to do on the subject of Daxam. Mon-El's parents don't have a history in the pages of comics, but the king does possess a tie to the past. The name of Kevin Sorbo's character is Lar Gand. That name actually is Mon-El’s true name in the comics. Clark gave him the name Mon-El because the youth arrived to Earth on a Monday. Clark pulled the El from his own Kryptonian name. Let's make this a meme! Combine the day you were born with the month you were born and add El. Mine would be Thursday and January, so I'd be Thu Jan-El. Do you think it was right for the DEO to help Kara rescue Mon-El? Did you spot any other #DCTV Secrets? What's your silly, doesn't-follow-any-logic-whatsoever Kryptonian name? I want to hear from you in the comments. Amy Ratcliffe covers Supergirl as a part of the #DCTV Couch Club. Look for Amy on Twitter at @amy_geek. Supergirl airs Mondays at 8 p.m. (7 p.m. CST) on The CW.